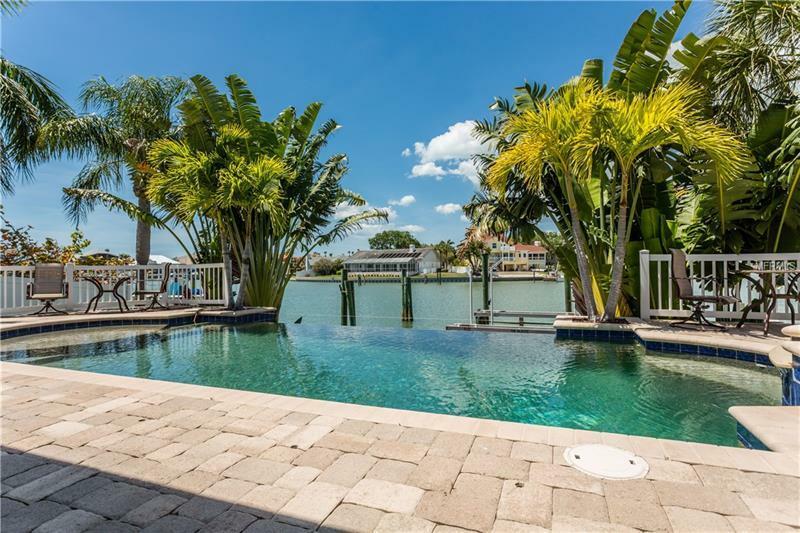 Enjoy the casual Florida lifestyle of glowing sunset views from the family room wall of windows poolside or on the dock overlooking the wide canal with immediate access to Boca Ciega Bay. This 3BR 2BA home has an open floor plan for personal enjoyment or entertaining with a central kitchen opening to the living dining and main family room as well as a passthrough to the bonus room wet bar in the L-shaped family room with built in wall cabinetry and plenty of area for pool play or additional dining. The large laundry is light and bright with storage cabinetry. A screened porch with sliders from the rear guest bedroom & door to lanai overlooks the infinity edged pool with spa and fenced yard. The oversized dock will accommodate a large yacht with tie poles water and electric in place and a 10000# lift that can hold a boat or jet skis. Luscious landscaping and circular pavered drive provide great curb appeal on the private cul-de-sac street. Located in Pasadena Yacht & Country Club a gated golf & waterfront community with an optional membership club with amenities including golf tennis marina fitness center casual and fine dining. Quick access to I275 for travel to downtown St. Pete & area airports local shops and restaurants and just minutes to the Gulf beaches. 13 mo. home warranty.